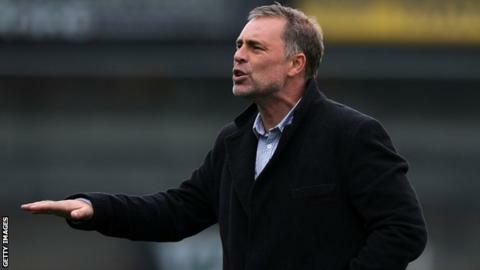 Luton manager John Still has backed Wayne Burnett to lead Dagenham & Redbridge to survival in League Two. The Daggers are on a run of 10 league games without a win and sit bottom of the table, three points from safety. "I believe Wayne will come out of it successfully," Still, who spent nine years in charge of Dagenham, told BBC Radio London. "I don't feel sympathy for Wayne, I have belief in him. Wayne will work hard and find a way." Burnett took charge of Dagenham when Still joined Luton in February 2013, initially being appointed as caretaker boss until the end of the season. The 44-year-old kept the east London club up on the final day of the 2012-13 campaign and was then handed a two-year deal as manager. He then led the Daggers to ninth place in 2013-14 and 14th place last season despite working with one of the lowest playing budgets in the division. However, Dagenham have only won once in the league this season and have the worst defence in the fourth tier, conceding 31 goals in 16 games. "It is really difficult to explain sometimes but every year Dagenham stay in the Football League is an unbelievable achievement," Still, 65, added. "They are down the bottom and finding it difficult at the moment and the one thing Wayne doesn't need me doing is making excuses for him. "He doesn't need sympathy from me because I would be doing him a disservice." Dagenham are not in action on Saturday because of international call-ups. Speaking after Wednesday's 2-0 defeat by Oxford in the Johnstone's Paint Trophy, Burnett said he is eager to improve the team's defending before Tuesday's FA Cup first-round replay at Morecambe. "At the moment we are conceding ridiculous goals," Burnett told BBC Radio London. "I can't get my head round it at times, whether it is a lack of concentration or poor technique. I can't legislate for errors. "We are bottom of the league for a reason and it is not a coincidence. "When you are not winning games it can affect your confidence a little bit. We need fighters and at the moment we haven't got enough."